This stylish and spacious two-bedroom apartment in Barcelona, located in the picturesque Eixample neighborhood, is a wonderful choice for those making a temporary move to the Catalan capital. The neighborhood is home to the famed Arc de Triomf and the apartment is within walking distance of the famous Passeig de Gràcia, plus many more of Barcelona´s top sights. This lovely apartment can accommodate up to four people. This modern apartment enjoys a chic design throughout, while the parquet flooring and exposed ceiling beams offer a stark contrast to the contemporary furnishings that can be found in this lovely locale. The trendy living room has comfortable sofas and a TV, perfect for relaxing after a day around town. The fully equipped kitchen makes it easy to create everything from a simple breakfast to a hearty meal. Both of the bedrooms are furnished with comfy double beds and plenty of storage space, ensuring an easy transition into this idyllic home-away-from-home. The apartment has one bathroom fitted with a walk-in shower. 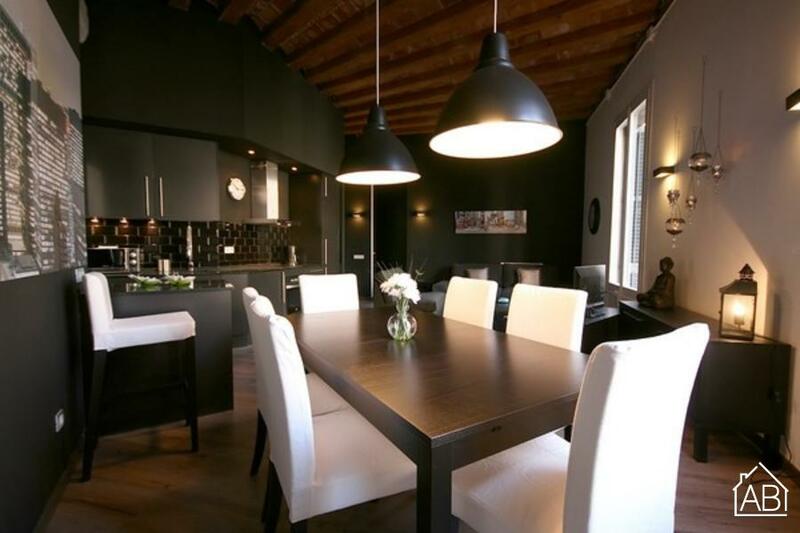 This beautiful apartment, complete with central heating and air-conditioning, is a wonderful choice for those making the move to Barcelona!